Anthony Watmough and Daly Cherry-Evans in days as teammates at Manly. MANLY captain Daly Cherry-Evans has finally responded after his premiership-winning former teammate Anthony Watmough took aim at him during the week. Cherry-Evans was asked if he had anything to say about Watmough's comments, following the Dragons 32-8 victory over the Sea Eagles at WIN Stadium on Saturday. "It's his opinion and everyone is entitled to one these days. "It's not important to me and I've got bigger fish to fry here at Manly. "I've got to try and win some footy games." Watmough opened old wounds last week when he told his side of the story about the break up of Manly's two-time premiership winning squad in 2012. 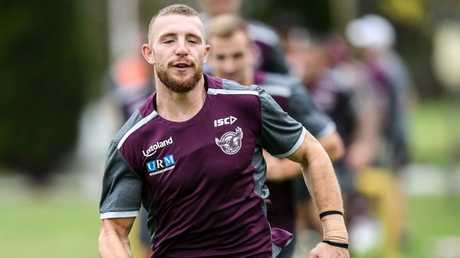 Watmough said the halfback told him he wasn't going to turn up to training unless he was given a better deal, and says Cherry-Evans "turned into a f***wit" after his first year in the NRL. Watmough blew up over DCE’s contract demands. "I said to him 'mate, you know what we've (the senior playing group) sacrificed to stay together, to be successful. "Your time will come' and he just looked me straight in the eye and went 'nah, not turning up'. So I just went 'f*** you'." Watmough's falling out with Cherry-Evans began in 2012 the year after the pair won a premiership together. "He just signed a four-year deal and he didn't turn up to training," Watmough explained. "He said his manager told him not to. "His idiot manager signed him for five years on no money because nobody thought he was good. "In the end Geoff Toovey succumbed to the board and he was put on $500,000 after being on $50,000. "Toovey chose the board and one player over the rest of the players and that's where he lost me." Watmough also came to the defence of Jackson Hastings believing his is the latest in a long line of people to cop the blame, while Cherry-Evans remains untouched. "It doesn't take a rocket scientist to see he has probably p***ed one too manly people off in the game," Watmough said. "I think people are starting to see it for what it is. "I don't really know the guy. I know people have different opinions of everyone but they, because Cherry-Evans didn't like him, they f***ing bullied him into a corner which was pretty poor on the club's behalf I think.